Security systems are complicated networks of switches and triggers that can be more confusing than anyone might expect. Sometimes, it’s hard to tell the difference between a quality system and one that should never be relied on to protect your home and family. Enter the security system salesman. You have to understand that for every good salesman who represents a quality company there is someone who is trying to rip you off or put your home in harm’s way. Scams are difficult to spot because the good ones are made to look like legitimate deals. Every time a scam gets exposed, someone else comes up with a new way to sell you junk. Always be sure to do your research on the company and the person that is selling you the security system. Sites like Angie’s List, Yelp, and even right here at A Secure Life, provide great tools to use to get reviews and recommendations that will help you understand if the product you’re considering is worth it for you. Another great tool for spotting scams is to ask the person selling you the security system to show you their contractor’s license. If they cannot produce a contractor’s license number and state that issued their license, consider looking elsewhere for your security system. Make sure you follow-up with the National Association of State Contractors Licensing Agencies (NASCLA) to verify that the information the salesman gives you is accurate and up to date. Finally, make sure that you see the equipment before you buy and inspect it yourself. If the salesman doesn’t have the equipment with him, you should be cautious. Make sure the equipment hasn’t been tampered with and hasn’t been opened before you sign anything. The Quick Decision is a tactic crooks use to try to make you agree and sign something before you’ve had enough time to look into the product or service they’re selling. Scammers will often times try to make you feel like you are in immediate danger and hurry you into a decision based on emotion and fear. Avoid the Quick Decision scam by practicing patience. Remember that there is nothing you have to buy “right now” and that legitimate businesses will be able to come back in a day or two if you decide you want their product. Similar to the Quick Decision, the Deal of a Lifetime is when someone only has “one system left” or “the price is only good today.” Most real companies don’t dictate their prices on a day-to-day basis. If you hear someone trying to tell you that something won’t be available tomorrow, you probably don’t want that system in your house tomorrow. There is a saying that goes, “nothing in life is free.” This is especially true when it comes to home security systems. If a salesman is offering you free equipment when you just pay a deposit or sign up for a monthly contract, there’s a good chance it is a scam. For those of you who already have a security system, there have been a number of scams reported where someone comes to your door and says they work for the security company. A lot of times, we leave security system signs or stickers in our yards or windows that are easy for someone to see and try to take advantage of us. No security company will show up unannounced. If someone says they work for the company and are there for inspection or maintenance, ask that they make an appointment through the company and not from an unannounced visit. Here’s a video from the AARP with more tips on how to avoid security system scams. The best way to go about looking for home security is by going directly through the company. The best security systems are from reliable companies that are accredited and don’t pressure you into trying to make a deal. There are DIY systems and fully integrated home automation systems that can offer you any level of protection you need. It’s really simple. If it looks and sounds too good to be true, it probably is too good to be true, and you should really find out if the “deal” you’re getting is really a deal at all. The best protection starts with doing your home work and making sure you don’t let someone take advantage of you and your family by scamming you. 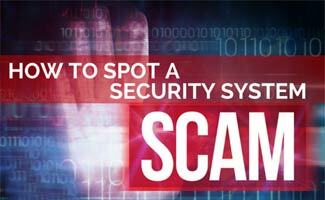 Have you been a victim of a security system scam?